Fugly Horse of the Day: Movin' on! "Wait! Wasn't this a horse rescue?Well, it was, but a particularly hard winter, lack of financial support and an abundance of "unwanted" horses lead to animal neglect charges and the closure of our facility.In the future we will be using this website as a place for our friends to check in on our progress as we make our new home in Arkansas." "Martin never planned to overcrowd her ranch, but it just happened. She said she tried to get rid of some of the horses, but there were no takers. "I didn't intentionally go, 'I need 40 horses this winter,'" she said"
Gosh golly gee, how is it that I'm not going to end up with 40 horses I can't feed this winter? Oh yeah...SAYING NO! It just happened. That's as lame as saying I didn't mean to get pregnant, it just happened. Life is full of choices, Carol - you made bad ones! Carol also thinks horses die from the cold. Well, Carol, I don't see any blankets in those pictures. Ever heard of taking them into the barn? Oh wait, I'm guessing you didn't have barn space for 40 - which do you think meant you shouldn't have had 40? 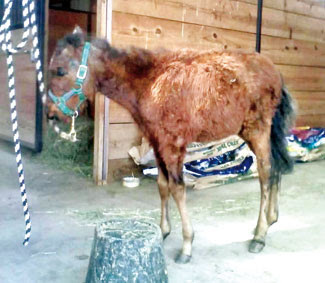 "Martin said she spoke with Sexton on Dec. 22 and agreed to surrender some of the sicker horses, but she was floored when animal control showed up with warrants on Dec. 26. She said the horses that died during a recent cold snap were ill or old, and lacked the body conditions to handle the cold weather"
This is the foal Asshat Martin was keeping IN HER HOUSE. Yeah. There ya go. He had one ear from a dog ripping it off (unclear whether or not it was Martin's dog). Another rescue tried to save him but he died a few months later despite their efforts. Video in his memory. Again, do you know what a rescuer is without money? A HORSE ABUSER. There is NO difference. You are not a better person because you became a horse abuser through over-rescuing. KNOW YOUR LIMIT, it's not that tough! Anyway, Arkansans take note - you have two new horse abusers to watch out for! Carol Martin and Keith Synnestvedt. HEADS UP! Do not under ANY circumstances sell or give these people a horse! They've killed enough of them already. They are legally barred from owning horses but you know that never stops people like this. So it's up to you - spread the word and watch out!